“Ping and Pong”, originally uploaded by bill kralovec. Picnicking is quite popular in Serbia. I think the fact that most Serbians live in apartments and don’t have much green space outside their homes, makes the locals want to get out a bit in nature. I love to go out with the family and spend an afternoon outdoors with a picnic lunch or a BBQ in the backyard. Last Sunday we drove up to Vršac, a city of around 40,000 people located in the Banat region of the Vojvodina province. The Banat is a flat plain located in Hungary, Romania, and Serbia. Vršac is near the border of Serbia and Romania. 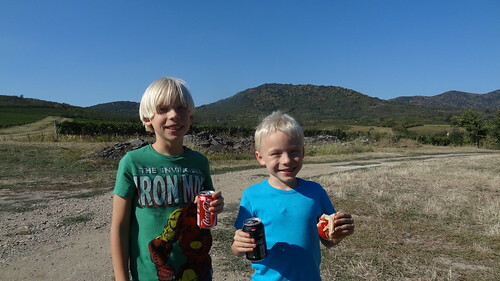 We planned to picnic near a monastery but found it quite run down, so we found a spot in the vineyards outside the city. There are several good wineries in the region. It turned out to be really nice. We played a lot of baseball and Nadia made some delicious chicken sandwiches. Nadia and Ocean also caught some late summer sun, laying on the blanket. 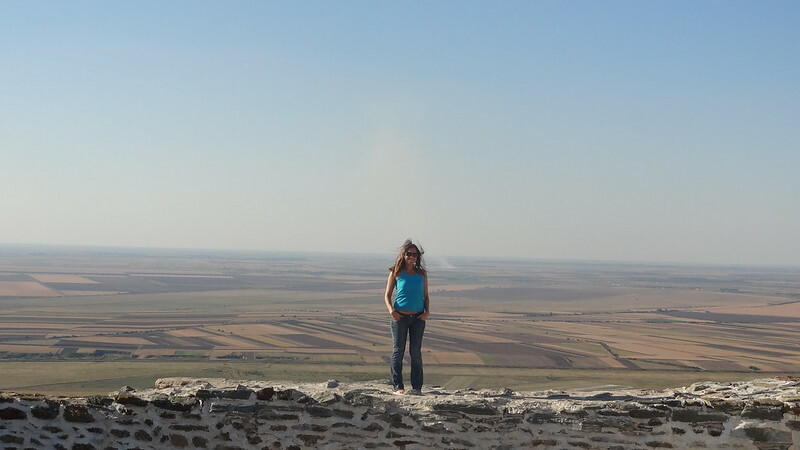 After we were done eating, we went up to the famous tower of the city. As you can see in the photo below, the Banat is quite flat except for the vrh (summit in Serbian) in the city. Because of its strategic position, there was always a fortress on the top. We walked up to the fort to enjoy the beautiful views. The kids liked to climb on the crumbling walls of the ruins. The tower is being renovated and there was also a paragliding runway at the top. It was a really nice day trip out of Belgrade. We didn’t visit any of the wineries, but might do it the next time we are in town. The city center is quite nice too, good for walking around.